1857: Completed by ? ?, Littlehampton as ELIZA CHARLOTTE. Registered at Hull (H??). 11.1869: Hull registry closed. Registered at Grimsby (GY266). 1.1.1870: Owned by George Goodwin, Kingston-upon- Hull. 1.1.1883: Owned by Walker Moody, Cleethorpes (J. Steer, skipper). 8.1887: Sold to Charles H. Saunby, 21 Albert Street, Fleetwood. Registered at Fleetwood (FD17). Coasting? 25/02/2011: Page published. 2 updates since then. This entry was posted in Sailing Trawlers and tagged Charles H Saunby, Ketch on February 25, 2011 by Fred Smith. 1911: Completed by Sanders & Co, Galmpton for Charles Bond, 16 Prospect Road, Brixham as FERN LEAF. 25.10.1911: Registered at Brixham (BM317). 5.5.1919: Sold to Charles C. Bond, Church Street, Brixham. 1922: Sold to G. H. Hole, 10 Trafalgar Terrace, Brixham. 25.4.1925: Sold to C. M. Ashford, ??. 30.8.1925: Sold to J. E. Rowse Jnr, Milford Haven. 22.1.1934: Sold to Ralph Stockman Dugdall, 57 Esplanade, Fleetwood. 9.2.1941: Requisitioned for war service and employed on miscellaneous Naval duties (Hire rate £20.0.0d/month). 1942: Brixham registry closed “no longer fishing”. 1943: Based Clyde as TRV attached to Alexandria Torpedo Factory, Alexandria, Dumbartonshire. Pre 1948: Sold for breaking up. 10/11/2018: Removed FMHT watermark from image. This entry was posted in Sailing Trawlers and tagged Ketch, Ralph Stockman Dugdall, Sailing Trawler on April 5, 2010 by Fred Smith. 1871: Completed by Sandwich Shipbuilding Co, Sandwich, Kent for Walker Moody, Cleethorpes as YOUNG WALKER. 7.1881: Registered at Grimsby (GY315). 7.1888: Sold to Great Grimsby Fishing & Steam Trawling Co Ltd, Grimsby. 10.1888: Sold to A. King, ??. 11.1888: Registered at Fleetwood (FD47). 22.5.1889: Sold to John D. Gibson, Fleetwood (managing owner). 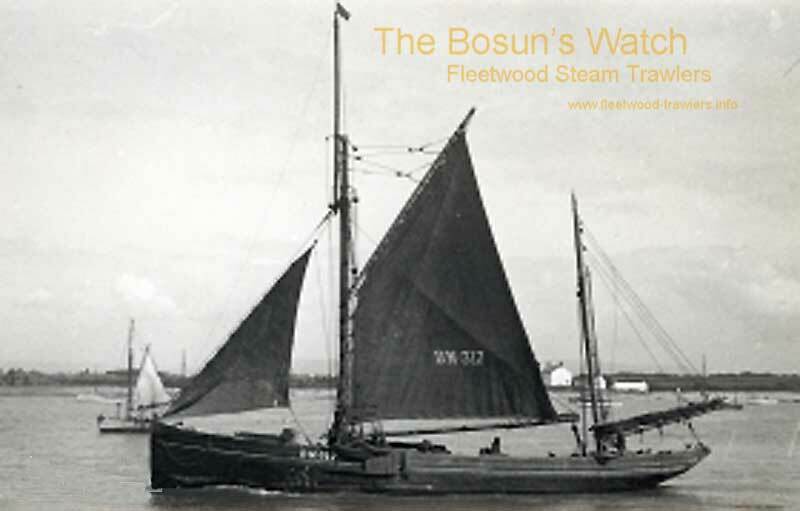 24.10.1898: Sold to Robert Westby, Fleetwood. 9.12.1904: Abandoned leaking 10m N of Great Orme’s Head and subsequently foundered. Crew of four Hoylake men picked up by Cork registered steamer INNISFALLEN (1405grt/1896) and landed at Liverpool. This entry was posted in Lost Vessels, Sailing Trawlers and tagged John D Gibson, Ketch, Lost, Robert Westby on February 24, 2009 by Fred Smith. 1900: Completed by ??. Freckleton for Richard Leadbetter & Others, Fleetwood (Mary Ellen Leadbetter (managing owner) as WHITE ROSE. 14.3.1900: Registered at Fleetwood (FD21). 31.12.1907: Tonnage altered to 24.80net. New Fishing Certificate issued. 1910: William Leadbetter, North Church St, Fleetwood (managing owner). 30.7.1920: Fleetwood registry closed. Sold to foreigners (Belgian subjects). This entry was posted in Sailing Trawlers and tagged Ketch, William Leadbetter on February 24, 2009 by Fred Smith. 1864: Completed by ? ?, Rye for John Lewis Potter, Kingston-upon-Hull, as VIVID. 4.1874: Sold to H. Smethurst Jnr, Grimsby. 4.1874: Hull registry closed. Registered at Grimsby (GY460). 1.1.1875: Owned by Henry George, Gt. Yarmouth. 1.1.1880: Owned by The Grimsby Smack Co Ltd, Grimsby. 1.1.1883: Owned by Charles R. Taylor, 230 Heneage Street, West Clee, Lincolnshire. 12.1886: Sold to W. Kennington, Grimsby. 2.1889: Sold to C. M. Mundahl, Grimsby. 6.1889: Sold to Charles H. Saunby, Fish Market, Fleetwood (managing owner). 6.1889: Registered at Fleetwood (FD57). 18.2.1892: Sold to James Jackson, Fleetwood. 8.12.1895 (? ): Fleetwood registry closed “No longer fishing”. 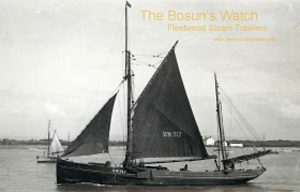 Employed as a trading ketch. 1.1.1899: Not listed in MNL. 24/02/2009: Page published. 2 updates since then. This entry was posted in Sailing Trawlers and tagged Charles H Saunby, Ketch on February 24, 2009 by Fred Smith.